Verdict: Real Product, MLM, FTC Investigated. Vemma, Just Another MLM Lemon? Vemma is a health and fitness product line that relies on MLM tactics to sell and to recruit new members to the sales force. The company offers both “immediate” and “long term” income based on standard, MLM payment plans. ***URGENT UPDATE: Vemma has been investigated and close down by the FTC. They may have been classified as a pyramid scheme by the FTC. Claims are that they were making over $200 million per year off of their illegitimate scheme and the initial stages of the shutdown have been initiated as of August 26th, 2015. Read more here. Little good, mostly negative when you really break down what the Vemma scheme actually offers. Has been investigated down by the FTC! Some of your income amounts depends on the performance of others. Who is Vemma Really Created For? Vemma is a decent business opportunity for anyone who is already comfortable with the MLM business principle and knows a little bit about what to expect from it. In addition to basic understanding of MLM techniques, Vemma does require users to have the financial ability to pay for a selected business pack and to make recurrent purchases to remain active. Vemma relies on different marketing styles from their members but does provide training as well as a lot of different tools to accomplish that. Training includes a suggested but not required DVD (extra cost of $49.95) called Driving Force. Additional DVDs include Making the Shift. Members in your team are also valuable resources for tips and training. People recruited into the program are often complaining about “hearing” about results, but never seeing results. This is very true with many pyramid…erm, MLM programs as the people up top and often times JUST the CEO’s and company owners are the ones that are making the money. The out of the box tools that the company gives you are very limited in nature. They include a free marketing site (which is essentially just an affiliate link to their site), a free mobile app (same thing) and marketing products including catalogs, guides, brochures, window decals and even a messenger bag. Typical stuff that any MLM would provide. You Want Support. It’s Run of the Mill. While there is a general Vemma community, each member is also part of a team. The team is usually comprised of the “blind leading the blind” as so few people actually achieve success within this program, that is difficult to get help from a sponsor that actually knows what they are doing. Don’t take my word for it, rather look directly at the Vemma reported payouts. Over 78% of people that join Vemma never make their money back and fewer than 1% of people ever earn enough in commissions to LIVE off of. This is a problem. Why would you ever join something that you know where your odds of making less than you invest is 78% (yes, this is the percentage of folks that lose money). You have likely been exposed to shameless marketing from a friend or a family member if you are reading this review in the first place. I watched a Vemma “review” the other day, and one of the representatives even stated that he would “trick” his friends to come over to his house so he could pitch the scheme to them. To me, that is first a horrible friend. Second, what kind of opportunity requires you to trick your friends. To a normal, ethical person this would set off red flags. Members can choose to come in as a Silver member ($499.95) or a Gold member ($999.95). Additional expenses including marketing material and extra training DVDs can increase this initial expense. There are also some ongoing expenses including recurrent purchases to maintain active status that should be considered. This program is rife with complaints, so you can expect that as you start recruiting people you are going to be at the receiving end of these (and your friends are going to blame you). Here is a snapshot from BBB.org where you will see that in just that last couple of years over 48 people have taken the time to report to BBB their complaints about this program. It is one thing to promote something that you believe in and that you feel is “good value”, it is another thing to be part of a scheme where you are required to promote a known “complaint heavy” program to others. Vemma has many of the same plus and minuses of other MLM companies so if you are expecting something new and exciting you will be disappointed. One of the biggest problems with all of these types of networks is simple: since they do not restrict the number of members they have in a single area, there is a very high risk of over-saturation. When that happens, new business becomes nearly impossible to find and the competition will turn vicious and ugly. Another issue is the fact that part of your income will always rely on the performance of others which means that not only do you have to monitor your own activity but that of others as well. You also have to remain aware that other people are relying on your performance in the exact same way. Plain and simple, if you are looking to create a business online, Vemma is not the way to go. There are much better and far more legitimate opportunities online. Do you have an “experience” with Vemma? Have you had a run in with an Vemma brand manager? 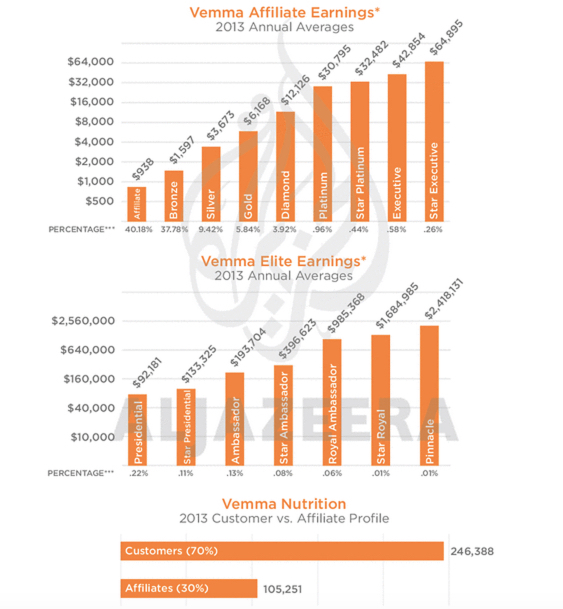 Do you have any thoughts or opinions about the Vemma program? I would love to hear about your experience, please leave any comments or questions below. Vemma ruined my life essential. Short version- I had the bad fortune to meet a brand member and we dated and started a relationship. His up line encouraged promoting the lifestyle you wanted but may not have. Basically make it look like you have money even if you don’t so that people will want what you have and come to you to get. Took a couple years to realize this man was full of lies and a narcissist. One of his up line also scammed him and he lost everything he had worked for causing him to spiral into depression and lose a lot of money(of course this could of been a lie to cover up the fact that maybe he never actually made money but couldn’t keep up the charade anymore) I guess I will never know. But once he lost his business he completely changed, was verbally, mentally and eventually physically abusive. No it is not Vemma’s fault directly but I believe his up line screwing him over changed him drastically. Sorry to hear about your experience and the toll it sounds like it lead to within several people’s lives, including yours. That is horrible. I hope you have come out of this ok and that you can look forward and see a brighter future. Unfortunately this tends to be what happens to lots of people when they get involved in MLM schemes that are taken down by authorities, lots of people always end up getting burned and lots of hard feelings and frustration is the end product. I have had some experience using Vemma. It does truly cleanse the system and provide bioavailable minerals, but I wish the people behind it would “fight the fight”, to have it sold in stores or drugstores. And with no “energy drink additives”, this is absolutely unnecessary and only decreases the quality. I know how hard the fight can be against the pharma industry, but creating an mlm operation with it and charging exhorbitant prices is only going to STOP people from exploring the way it’s derived and using it…. Thanks for showing that a good thing can be made bad by a wrong sales and distribution strategy! The problem with programs such as this is that the scheme itself becomes more about recruiting others in the program and getting them on automatic purchases versus actually selling the product to customers. The reason being is that MLM products almost ALWAYS are not fair market value, they are highly inflated for the simple fact that they have compensation plans they need to pay out. This inflates the prices and people promote these products not because their quality, rather because they have to speak nicely of the products because they are part of the system. How’s vemma status as of today ? I remember in 2013 I was scammed by an anonymous facebook friend and that wasted me 40% of my monthly internship earnings. Realising the consequences I immediately sensed the trick and took an ethical decision not to scam my friends into the trap. I wonder if the founders of this vemma program are still earning any passive income from it. Thanks for the news update I believe they should be shut down indefinitely. I was involved with vemma about 2 yrs ago I see could pretty quick that there could be some problems. first off it was not for everyone I have a blood disorder and I found out about 6 months into it that mangosteen is a blood thinner, when I told some of the peopl e in my group they tried to down play it and one of them had a husband that was a dr. I’ts almost too bad about the company though because i think they had a pretty good product. I predicted this when Vemma first came out. It was totally overpriced for health and nutrition if you ask me. You can spend less than that at the grocery store investing in a clean eating regimen….As soon as I saw it trending on FB I knew I could come here and see the update! Thanks Kyle! And the only reason it was priced so high was to afford the hefty compensation plan and the “trickle up” structure. The CEO was making $12 Million per year where the average person within Vemma was losing money purchasing these overpriced and unproven energy drinks. I’ve been studying internet marketing for quite some time now but I still fail to see the attraction with this MLM format ( if anything I don’t fully understand how it works! ). It often seems to me to be nothing more than a simple pyramid scheme. A friend of mine who now lives over in America recently got into this Isogenix thing with his wife. They both use the supplement for health reasons but they were also looking to make a little green on the side off it. I did warn him that it sounded like a MLM platform but he didn’t listen…and now he has a nice new monthly bill he didn’t see coming. I suppose it’s just good advertising by these sorts of companies that manages to rope so many people in? That is because that is exactly what it is 90% of the time. The MLM companies CEO makes a lions share of the profit, in this case the founder of Vemma was making $12 million per year while 99% of the reps weren’t making enough back to support their monthly REQUIRED product purchases through the company. Even programs that MASK themselves with a better purpose, healthy drinks, are overcharging for their products just to support the commission structure and the overall scheme itself. You should have to sign-up paperwork in order to buy healthy drinks, in fact, you can head to your local grocery store and pick up some organize produce and make the healthiest juice in the world (for pennies on the dollar). Hello Kyle, these MLM scams keep popping up every day. My mind worry is that you expect me to market a product you should have spent hundreds of thousands of dollars to market and you will expect me to pay for training? That is unthinkable. The startup capital is also too high, for just $500 I can get almost two years subscription for my membership at wealthy affiliate. Vemman? No, I will stay with WA. You not only have to buy into the scheme, you have to buy their overpriced products in a recurring manner to stay part of the program and then to make any money with the “opportunity” inside of Vemma you have to get a lot of people to do the same thing as you. You start running out of friends pretty quick that want to “sell” overpriced and unproven energy drinks…just so they can do the same to others. You are more likely to lose friends/family that like you by being part of this program, which seems to be the case with many folks that I have spoken with. Yeah, and of all MLM’s I have heard some of the worst stories about Vemma and how pushy people within that program can be to get others to join their downline. If the products were so good (which they are not), then they wouldn’t have to build their business based off of building a pyramid, they would sell the actual product itself. Another shameful MLM unfortunately and I don’t think it is going to be long before it suffers the same fate as MonaVie. I would never want to take part in this opportunity. The same goes to all other MLM crap. It seems like very few actually make something from these kind of things and I wouldn’t place my trust to become that 1% ! I have a question. Did you participate in the Vemma and did you find any way to make a decent buck on it ? The only way to make a decent buck with Vemma is to shamelessly get others involved in the program through your downline. The outside world is not becoming customers of Vemma products, it is the very people within the scheme itself that are buying it (as they are forced). That is not a real business, that is nothing more than another MLM scheme. Great article… I was introduced to Vemma back in 2012 and unfortunately I got sold into the HYPE of the company. Lost over $1,500… Don’t waist your time or your money! Sorry to hear Nathan, but you are definitely not alone. Vemma continues to do business in the same sort of manner and it is stories and feedback like yours that will prevent others from being “taken” by this scam. Since they do not restrict the number of members they have in a single area, there is a very high risk of over-saturation. That is the case with most MLM’s, there is a dilution of the opportunity as more and more people become part of the program in a specific area. I can remember not too long ago when everyone was pushing MonaVie, now I don’t even hear of it (and there is definitely very few people pushing this “koolaid” to folks now). Not only are the products overpriced, but the opportunity becomes quickly diluted because membership saturation. I looked up Vemma Nutrition on Sec State Arizona and looks like the officers there are different than the “medical and or other professionals” on the site. Medical studies are now exposed as the most corrupt scams that have people gobbling down drugs like kids at a movie theater with a box of milk duds. This place should be called vermin not vemmma. After literally having to pay a Melalucca pressure sales guy to get him out of my house once any of these MLM are not appealing to me. Thanks for the heads up on this one. At the end of the day, Vemma or otherwise, these health product based MLM’s are all the same. I wouldn’t deny the fact that some of their products are of decent quality, but what I would argue is that they are overpriced…and often times vastly. The reason? In order to keep the compensation plan in place, Vemma needs to overcharge for their products. That is the story will all MLM’s. The customer loses out on value because of the ridiculous pyramid structure and the commission payouts required within these programs. I sense a bit of sarcasm here! Of course, I have run into a few of them over the years and they are all doing the same thing. They try to hustle you at any chance they get to by their “drink”…and basically drink the koolaid they are trying to sell within their program. Vemma only works because of it’s compensation plan. It forces people into selling their overpriced juice to others…only because their is financial gain from it. If they stepped outside the program itself and treated the people they were selling this product to like they would want to be treated themselves, they would absolutely not be recommending what they are selling. This goes for pretty much every MLM.